Here’s your News roundup for Thursday, January 25. This is our way of keeping you up to speed on all of the stories circulating in the world of pro cycling. In the same vein as the Hammer Series, Thursday’s Race Melbourne criterium wasn’t a simple race to see who could cross the line first. Instead, teams tried to accrue the maximum points throughout the 63.6km race in bonus sprints and at the finish on the F1 circuit in Australia. 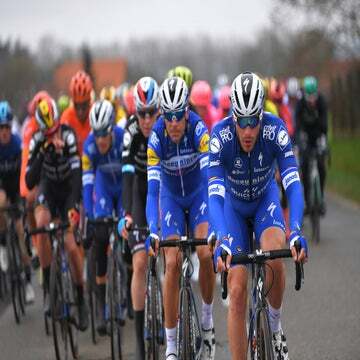 Deceuninck-Quick-Step came out on top with 95 points to Jumbo-Visma’s 57 points. Bora-Hansgrohe was third with 40 points. The race served as a tune-up for Sunday’s Cadel Evans Great Ocean Race in Geelong. As you might have read in our last News Roundup, a new Zwift virtual racing league kicked off this week, featuring a stacked field of Pro Continental, Continental, and wildcard riders keen to mix it up with the pros. If you’re like us, you might have wondered what this looks like. Here’s a highlight reel from Zwift to recap the action from round 1. Round 2 of the KISS Super League takes place Wednesday, January 30 at 19:00 GMT. Speaking to Owen Rogers of Cycling Weekly, Vincenzo Nibali (Bahrain-Merida) said he will likely skip Milano-Sanremo this spring. He won the season’s first monument classic in his typical swashbuckling fashion last year with an attack on the final climb, the Poggio. 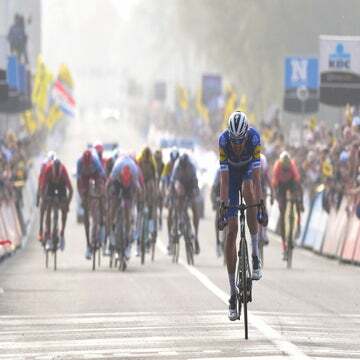 He also is not planning to return to Tour of Flanders, where he was an animator in 2018, helping to set up Niki Terpstra’s winning attack. Instead, Nibali’s sole focus for the first half of 2019 will be the Giro d’Italia, which he won in 2013 and 2016. “I have one target and that is the Giro d’Italia,” Nibali told Cycling Weekly. In the build to the Giro, Nibali is expected to race Tour of the Alps and Liège-Bastogne-Liège. Continuing on the Nibali theme, CyclingNews reported good news Thursday that Bahrain-Merida has resolved its financial shortfall that saw several riders, including its Italian star, go unpaid in December 2018. That troubling news came in contrast to the excitement surrounding the addition of McLaren to the team’s family of backers. The British automotive company is expected to lend a great deal of technical expertise to the team, which is notable given the addition of world time trial champion Rohan Dennis to the team for 2019.